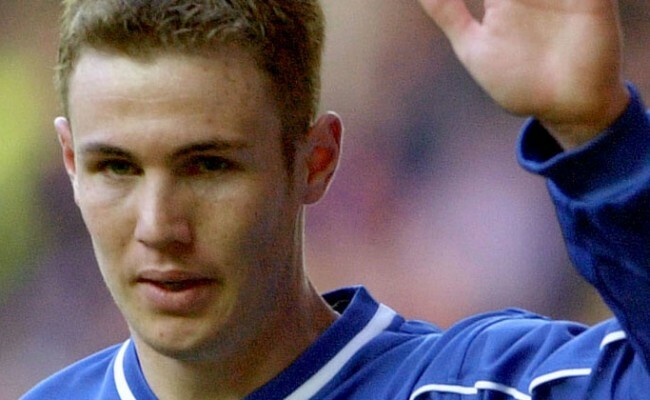 After five years, 82 goals and so many great moments for the supporters who came to worship him, Albertz is leaving Rangers to rejoin his old club Hamburg, primarily to be nearer to his father Reinyr who has been unwell. He hd tears in his eyes as he took the acclaim of the supporters and little wonder. Albertz has had a huge impact on the club and his loss will be considerable. Tugay, of course, is off to Blackburn while Giovanni van Bronckhorst looks like joining Chelsea in the summer. Rod Wallace is also leaving while Sergio Porrini has already gone and Lorenzo Amoruso has expressed his desire to depart meaning that next season, in so many ways, is going to be a fresh start at Ibrox. Perhaps the man to lead the charge is Ronald de Boer, the £4.5million signing whose first season with Rangers has been so frustrating for him and the supporters too. Having endured so many difficulties since joining Rangers from Barcelona, the season has finished too quickly for de Boer. Having starred in last week’s demolition of Kilmarnock the Dutchman was hugely instrumental in the defeat of Hibs. De Boer’s passing was incisive, his movement was too astute for his Hibs opponents and he found the net for the second week running, this time scoring two goals to make it a wonderful afternoon personally. Clearly there will be even better to come next season and the vastly experienced midfielder has indicated that he can be very productive playing ‘in the hole’ behind the front two. 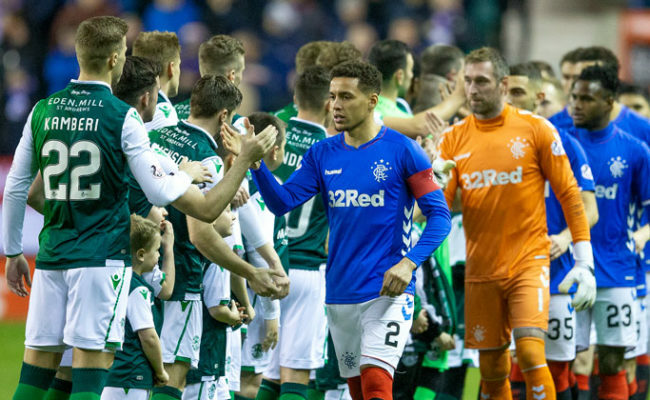 Overall it was a strong Rangers performance as Hibs were made to look like confused bystanders at times, which hardly augurs well for next week’s Cup Final. De Boer, Albertz and Tugay moved the ball around with an ease which must have been very uneasy for Alex McLeish and Rangers’ two-goal half-time lead was just reward for their dominance. Fittingly it was Albertz who gave Rangers the lead with an immaculate penalty after just 13 minutes. It was his 82nd goal in Light Blue, which indicates his considerable worth in the past five seasons. Marcus Gayle, making his first start since March 31, was the man who made it all happen when he evaded two challenges to release de Boer in an on-side position on the left side of the box. 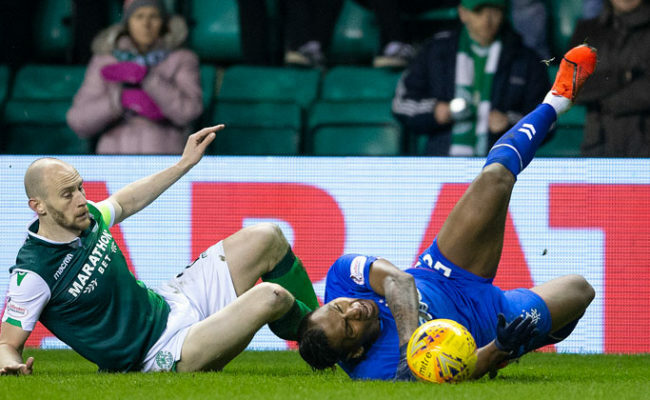 Nick Colgan clipped de Boer as he tried to dance past him and big Jorg did the rest, slamming his spotkick in the left corner before a customary kiss of the badge in front of the disgruntled Hibs supporters. It was the hugely popular German who was the creator of the second goal in 33 minutes with the type of pass which made him a legend in the eyes of the fans. Hibs were helpless as Albertz picked out Rod Wallace on the right side and the little Englishman, who was also playing his last game for the club, unselfishly squared the ball for de Boer to score with a simple tap-in. 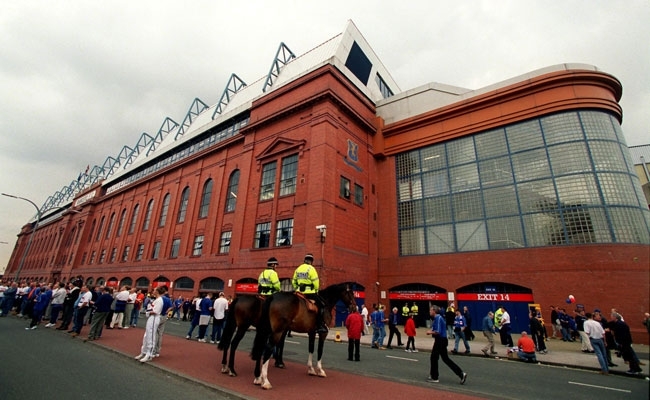 It was a surprise that Rangers had taken that long to reinforce their dominance. Gayle had come close with a left foot shot while Amoruso hammered a right foot shot from Albertz’s short freekick which Colgan brilliantly pushed away for a corner. Tugay should have made Franck Sauzee pay for some slack defending in 41 minutes when he stole the ball from the normally reliable Frenchman and waltzed in on goal but tried to be too cute with his finish and Colgan made a blocking save. Rangers were simply streets ahead, although they had two worrying moments either side of half-time before de Boer stamped his class on the match yet again. Tony Vidmar, back in the side for the rested Craig Moore, made a crucial challemge on Marc Libbra in 43 minutes as the Frenchman bore down on goal. Then in 53 minutes Stefan Klos made a terrific block from substitute Grant Brebner’s thunderous freekick to emphasise his massive worth. Time then for Mr. De Boer to sort things out and he did so in some style in 56 minutes. It was Amoruso who picked him out in the box and the former Ajax and Barca star set the ball up before hammering a volley into the top left corner. 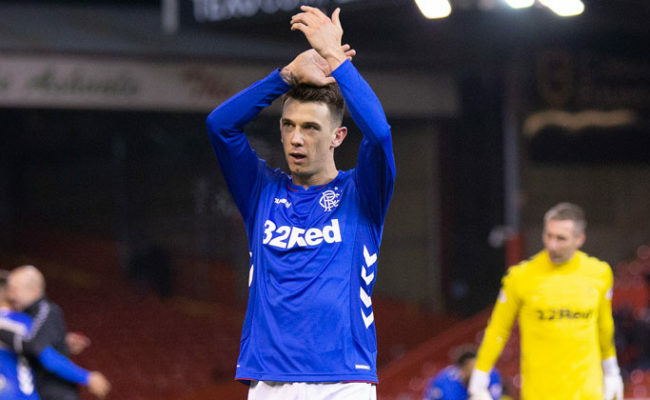 The game was finished there and then although Rangers tried to give their fans more goals. Peter Lovenkrands, a half-time sub for Wallace, forced Colgan into two excellent saves while Gayle also had a couple of chances but could not take them. Van Bronckhorst came on with 67 minutes played to get his last taste of Ibrox life and the fans gave him the respect his three years with the club have deserved. 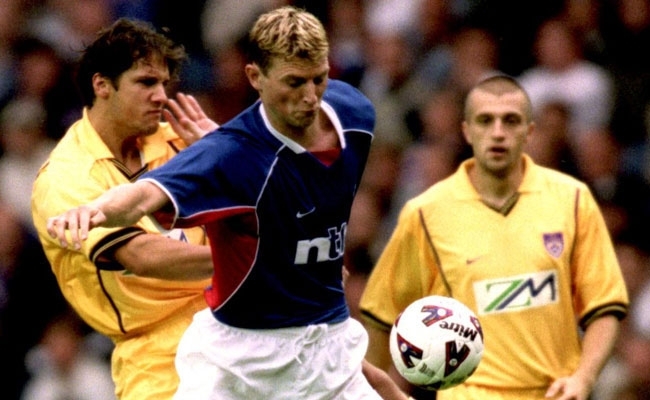 However, it was Tony Vidmar who had the final say in what was an absolute stroll for Rangers with a fourth goal in the final mimute with a terrific solo effort. The Aussie made a storming run from just over halfway and then slotted a great left foot shot past Colgan. Then when Dougie McDonald blew his final whistle it was the cue for some emotional scenes. 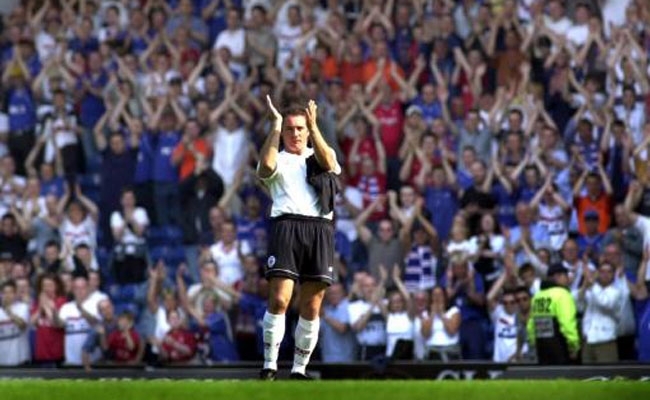 Amoruso and Albertz hugged each other in the centre circle then the German and Tugay performed a lap of honour to earn a send off from the supporters. The final curtain may have come down for many, but the stage is set for de Boer to become the leading man next season. 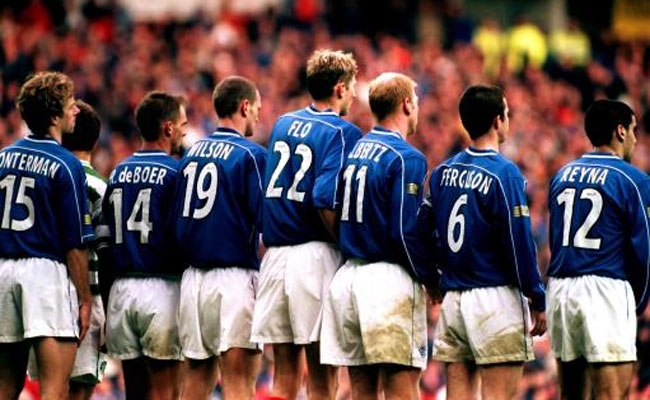 RANGERS: Klos; Amoruso, Konterman, Vidmar; Ricksen, Tugay, Albertz, Numan (van Bronckhorst 67); de Boer (Dodds 67); Wallace (Lovenkrands 45), Gayle. Subs not used – Christiansen, Kauppila. HIBS: Colgan; Fenwick, Sauzee, Laursen; Lovell, Arpinon (Brebner 45), O’Neill, Jack (Lehmann 73), Murray; Zitelli, Libbra (Paatelainen 65). Subs not used – Westwater, McManus. Moment of the match: Albertz’s pass which led to the second goal.